An early Summer Exhibition at the Academy's original home in Somerset House. The Royal Academy (RA), is an art institution based in Burlington House, Piccadilly, London. It is a club for top painters and sculptors. They elect their own members, and give regular exhibitions of art works. 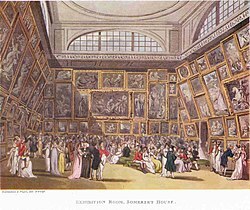 The Royal Academy was formed to rival the Society of Artists after an leadership dispute between two leading architects, Sir William Chambers and James Paine. Paine won, but Chambers used his strong connections with King George III to create the Royal Academy, in 1768. It was formally launched the following year. Sir Joshua Reynolds was its first president, and Benjamin West its second. ↑ RA is an acronym. RA stands for Royal Academy. This page was last changed on 26 July 2018, at 05:48.